EZ DAM® is one of the few versatile products in dentistry that simultaneously completes 5 different tasks. 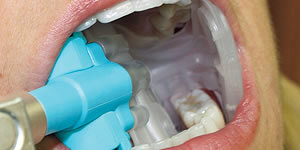 It retracts the tongue, retracts the cheek, is a throat pack, is a bite block and performs high volume suction - all at once. This truly benefits both you as a dental professional and your patients by saving valuable time, while providing a more comfortable and safer dental experience. 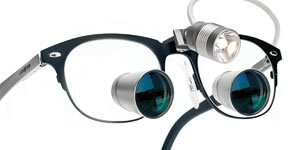 It eliminates the need to focus on suctioning so the dental team can concentrate on the procedure. Proper isolation of the oral cavity reduces humidity, protects the patient, offers less interruptions, provides retraction of the cheek and tongue, isolates the working field, and evacuates fluid from the oral cavity. EZ DAM® allows for predictable results, increases resin bond strengths to teeth and decreases microleakage. Proper isolation prior to the placement of dental sealants is imperative to the long-term success of the bond. Restorative outcomes are improved by keeping the mouth dry and facilitating better impressions. The bottom line: better, consistent moisture control results in superior success. When performing sedation EZ DAM® helps keep the mouth propped open for easier access to the oral cavity. 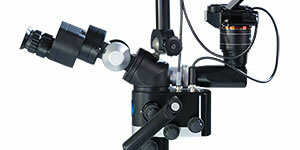 It also retracts, protects and manages the airway and soft tissue during the procedure. EZ DAM® is great for placing implant screws and other small devices by keeping everything out of the way, protected and dry. EZ DAM® is perfect for hygiene, it allows you to work quickly and easily in two quadrants at a time, increasing efficiency and streamlining procedures. 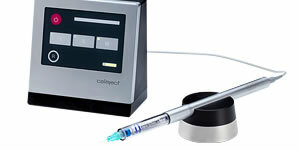 The bite block is more comfortable for the patient and the specially designed customizable mouthpiece offers safety from injury, aspiration, reduces aerosolic particles and decreases other potentially infectious materials when using highspeed handpieces and ultrasonic scalers. Dental emergencies are unpredictable and are time critical. EZ DAM® provides your team with a safe and efficient way to control the oral environment regardless of the situation. The versatile combination of retraction, suction, throat packing and bite block allows the situation to be managed quickly and safely. Also, once anesthetized, the mouthpiece acts as a barrier for dislodged or undetected objects in the mouth. This is very convenient especially when multiple quadrants are involved. Flexibility and freedom – EZ DAM® acts as a continual suction assistant which can free up your staff for other needs.